admin / March 15, 2017 / Comments are off for this post. 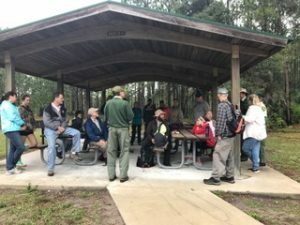 Park Biologist, Ralph Risch, Park Ranger, Mike Martin and author and naturalist, Bill Belleville opened the morning with an introduction to the hidden springs of Seminole State Forest. Twenty-five undeterred hikers, wearing various forms of rain gear from ponchos to black trash bags pilled into 4 wheel drive vehicles and headed out to personally discover hidden springs in SSF. 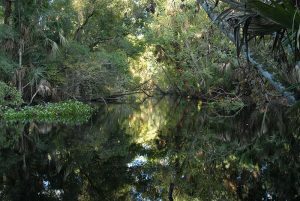 To see Helena Springs we trekked along a long narrow path bordered by low-growing palmettos. 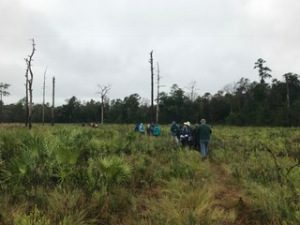 We slowly descended to the wetter ground and entered a hardwood hammock. There, before us, appeared a crystal clear pond. As we looked down we could see not only our reflection but the boil that was releasing the underground water. 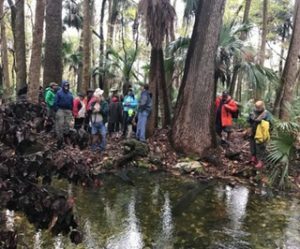 In the other springs we saw the water flowing out of the rocks, forming a stream that would eventually empty into Blackwater Creek, the Wekiva River, the St Johns and finally into the Atlantic Ocean. admin / March 13, 2017 / Comments are off for this post. 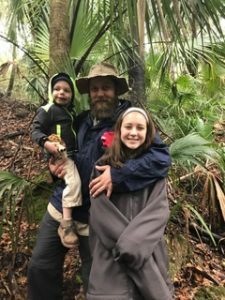 April 9,2017 - Paddle to Lake Norris. Paddle on Black Water Creek through hard- wood swamp to Lake Norris, a dark-water lake ringed with cypress trees.